Etching House is the largest stockist and retailer in Australia of Garry Shead original limited edition Fine Art Etchings and prints,works on paper Prints in both NEW and the SECONDARY state. The Garry Shead limited edition Etching titled “Annunciation” is only available from time to time should clients wish to sell such fine works. Annunciation was released 2002, it was an edition of 75 only that sold out quickly and since doing so has had excellent capital growth, this particular etching is very sentimental to us at Etching House, should you like a “Annunciation” etching please let us know, we will place you on our waiting list, if and when one becomes available. Garry Shead won the Archibald and Dobell prize. 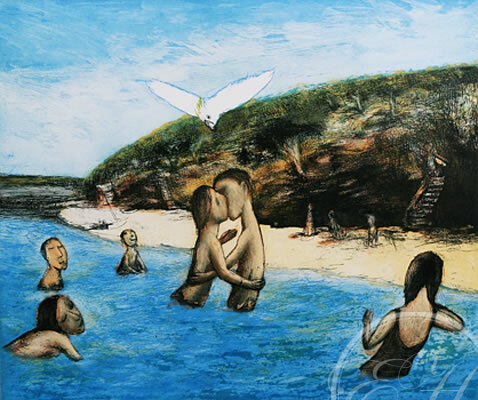 An Australian artist Born 1942, The D.H. Lawrence series of painting’s and etchings brought Garry Shead closer to the Australian people, this incredible series of Australian paintings really made a solid mark in the art world. Garry Shead doesn’t just have one or two series that have made him so loved and regarded, in fact he has had nearly all of his series consistently enhance his reputation bringing his talent and spirit closer to art lovers and collectors at all levels and ages, here are some of the series to date – Garry Shead’s Annunciation, Epiphany, Tango 1, Tango 2, Tango 3, Tango 4 and Last Muse, Artist, Monarchy Series, Ern Malley series, The Magus Study, The God game, Bundeena series, and the ever popular D.H. Lawrence series, with works like Checkmate, Arrival, The Supper, Awakening and The Wave just to mention a few. Garry Shead released recently his large coloured Etching titled -The Sacrifice; before this it was The last Muse, Tango 4 or Tango Four. So much of each series has also been done in spectacular Oil Painting’s, with record prices being achieved at Blue Chip Auction house’s for his Australian Painting’s, most recent was “Queen of Suburbia” $432.000 at Sotheby’s in 2007, it is featured in this gallery section. In summary Garry Shead has a diverse range of subject matter and medium that constantly has found broad public appeal while at the same time achieving his personnel objectives, that is finding Beauty and Meaning with content all wrapped with shear talent and then sharing it with the us all. Garry Shead is truly one of the best Iconic Australian Artists, with total passion for his work, Etching House is proud to be a part of this Artist’s World of fine Art, So can you. Garry Shead has made works of art using fine art mediums such as – Etchings, Drawings, Prints, Lithographs, Collagraph, Silkscreen, Oil paintings, watercolour, Gauche, Mixed media works on paper to mention a few.